I started using Mineral Hygienics a few years ago now and I don't believe I'll ever switch. I used the most expensive foundations before and it seemed that everything I've used would just dry out my skin or not let it breathe which would mean that I'd be breaking out. It wasn't pretty. Working with the public I would always have make up on but numerous times I would look in the mirror and I couldn't recognize the person staring back at me. I was on the hunt to find something more natural and something better for skin since I was taking extra measures in all aspects of my life to keep it healthy and in great shape but not my skin. It was as if my skin care and make up routine had a mind of its own. I kept on telling myself that this is as good as it gets and I should just make peace with the fact that you can't have beauty and have a product that's also great for your complexion. I have always had very sensitive, very fair skin. I also have allergies to several foods. Many face and body products use harsh chemical ingredients, and some even use ingredients derived from wheat or dairy. I use gluten-free, vegan, all-natural face and body products, but until I found Mineral Hygienics, I had been frustrated not only at the difficulty of matching cosmetics to my skin, but at the irritation they caused, being at times extremely drying or resulting in painfully itchy, angry rashes. I have probably tried a hundred different foundations, varying from drugstore brands to pricey “natural” ones, in all different formulas and types. I had even tried other mineral foundations, which did not work any better and some of which had ingredients like bismuth oxychloride, which made me break out in hives immediately after application. I found Mineral Hygienics through research online and decided, rather skeptically, to try it. Upon first use, I liked it. After a few weeks of use, I loved it. No breakouts, no irritation, no chemicals or ingredients I’m allergic to, FINALLY, a solution. I loved the fact that the starter kit I purchased had two shades to choose from or mix-and-match. I was the fairest one, of course, but it is a perfect match and I look and feel like I’m not wearing anything at all, but have flawless skin. I’ve since purchased several eye shadows and full size foundation powders, as well as a brow powder. The brow powder shade I chose at first was too light for my dark hair, so I sent it back as an exchange and received the replacement within a few days. I cannot say enough about the quality of Mineral Hygienics products AND customer service. Thank you! I sweat constantly, so I had discontinued wearing any makeup. That is until I found Mineral Hygenics. It is very lightweight and feels like I'm not wearing any. I recommend it for people who don't like the caked on feeling of makeup but still want to look natural. All of the benefits of our Sheer Perfection Mineral Finishing Powder, Plus the added benefits of oil absorbtion. If you are prone to oily skin. Use this special powder to reduce oil and shine. Use as much as you need, all throughout the day, it won't cake up or enlarge your pores. I just exchanged for this for one of the items in my starter kit that was too dark for my skin tone. The exchange was very quick; it took about five days round trip to get my new product. I put on the matte powder underneath my foundation before going to work. I worked for 10 hours through a rather scorching day going between indoors and out. I came home and looked in the mirror, expecting to see an oily mess like I usually would. (My skin is normally very oily.) My skin looked just like it had when I first put my makeup on before work! Even my nose and t-zone were oil free. I highly recommend this for people with oily skin. Despite the fact that it is a "matte" powder, it blends in with your skin a few minutes after putting it on, so it looks natural and not powdery or fake, which makes it perfect for my tastes. 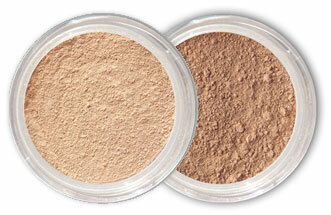 It is the first oil absorbing makeup I have tried that absorbs oil all day, lasts through work, and looks natural. It also being one of the Mineral Hygienics products, I know it will be safe to use with my acne.